The Finest was purchased from NY Waterways in 2017 and refurbished at a cost of $7.5 million by the Whidbey Island-based Nichols Brothers Boat Builders. She was originally built in 1996 and primarily ran on a route across the Hudson River connecting Manhattan to Weehawken, New Jersey. The Finest played a small role during the “Great Boatlift“, assisting in the evacuation of Manhattan during the aftermath of the September 11 attacks. The Finest can carry 350 passengers across its two decks and reaches a maximum speed of 35 knots (but will normally run at 29 knots). During a preview ride earlier this week, she was able to smoothly gain speed, though the fumes from the diesel engine may overwhelm those stuck on the outdoor deck. The Kingston fast ferry may have all the signs of a fresh and new service, but it is actually part of a long history of passenger ferries that docked in Kingston. From the Mosquito fleet to the ill-fated Aqua Express that shut down in October 2005, various companies have tried unsuccessfully to serve the Kingston area with a direct ferry from Seattle due to costs and the small market. 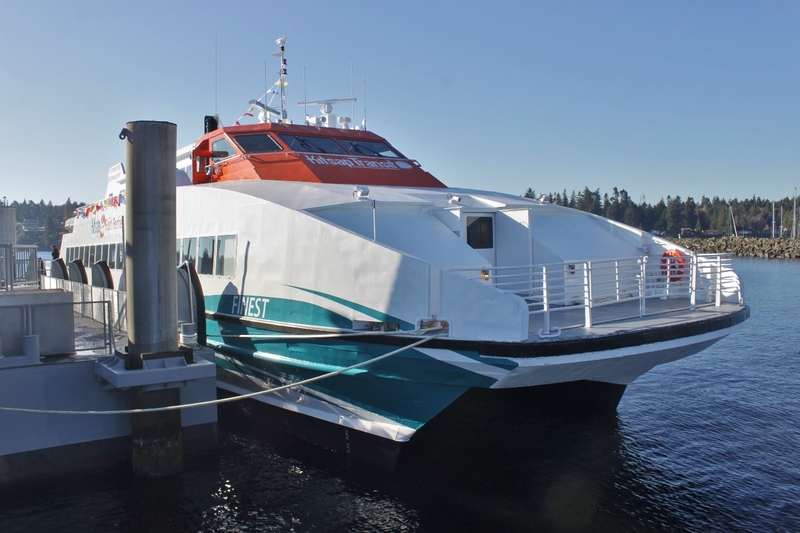 Kitsap Transit is attempting to stretch the usefulness of the fast ferry by introducing two new express buses that will connect the Kingston terminal to park-and-ride lots in Suquamish and northern Poulsbo, similar to the fast ferry feeder routes used in Bremerton. Fast ferry service will cost $2 for eastbound travel from Kingston to Seattle and $10 for westbound travel from Seattle to Kingston, payable with cash or an ORCA e-purse, since regional day passes aren’t accepted. Kitsap Transit is waiving fares for the rest of the year to encourage riders to try out the service and potentially stick around. On Friday, November 23, the Finest will be running a special preview schedule and also have waived fares for riders. In any case, the Kingston fast ferry could prove to be popular with tourists as a lower-cost alternative to Elliott Bay excursion cruises that normally start at $27 before fees. Beyond that, the usefulness of the Kingston route will have to be seen, as the market is not particularly strong. Expect plenty of seats for the reverse-direction trips for the foreseeable future, but potentially a few full boats during peak periods. This is basically a euphemism for more sprawl, unless Kingston has some massive upzone planned that we don’t know about. That said, one would be foolish to base a long-term decision like building or buying a house, based on the existence of a fast ferry service that just opened, has uncertain ridership, costs a boatload of taxpayer money to operate, and is very likely to get cut, as soon as the next recession hits. And in fact already got cut once before. Much of the Kitsap Peninsula as well as the northern and eastern edges of the Olympic Peninsula are already mostly sprawl anyway. Port Angeles to Port Townsend to Kingston all the way down to Shelton and Olympia is pretty much indistinguishable from Arlington or Yelm or Tenino. While it’s certainly a cool option, they should hope oil stays cheap. Kitsap transit said grants would pay all capital costs, but instead they’ve borrowed $60 million – including from buses – to launch this service which will have rider subsidies in the $30 area per trip. Paid for by a sales tax. Oddly enough, just in January of this year they sold the Kingston Express, which was the last of the boats used on SoundRunner for this service from 2010 to 2012. Why do they persist in buying such large vehicles? It’s hard to imagine filling multiple runs of a 350-people capacity boat from such a small population center. 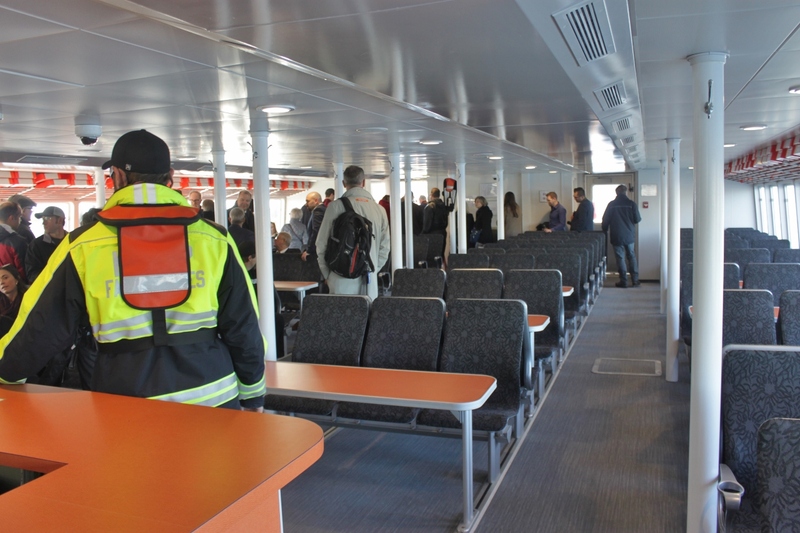 Is it that a 50-person ferry isn’t much cheaper to buy or operate than a 350-person ferry? The only profitable ferry operation I’ve seen is the 5-person gondolas transferring people across False Creek in Vancouver. Persist? The Rich Passage 1 holds something like 118 people and is typically full during rush hour. I agree 350 seems way too big for the Kingston route, but I’d like to see a bigger boat on the Bremerton route (or a second, similar-sized boat to add frequency and capacity that can be easily scaled down when needed). Why do people persist in thinking that the population of the Kitsap might not someday be in the hundreds of thousands? Lots of pics of whole Seattle area a hundred years ago, where close elections were finally settled by cows. Present sprawl around Poulsbo…where would anybody rather its expanding population go instead? And better boats than a bridge- which has been discussed. Sprawl- great word for the phenomenon, isn’t it?-isn’t really about population to space ratio. It’s a political matter, about how people choose to arrange themselves. Or have to, when they lose both their homes and the jobs they used to live near. If handled right, 2008 Part Two could be beneficial. Depends entirely who’s in charge of banking and the country it’s attached to. Next time the Federal Government has to rebuild private banking with taxpayers’ money, have Us The People keep it and run it. In 2009,I remember acres of foreclosed-before-ever-occupied homes to the horizon. Buy them, bulldoze them, and rebuild in orderly transit oriented corridors edged with farms, fields, and forests. If you want, call THEM subareas, and partisans will just go ride the tains. Oil? If there’s anything everything floating, rolling and flying and rolling past Winslow in fifty years, last thing it’ll be powered with is petroleum. Challenge will be what happens when the kite gets tangled up in the Tacoma Narrows Bridge. Too high in a tree for the Steilacoom fire chief to come climb up and get it down. Though on the other hand, could give “Galloping Gertie” the best sequel in movie history. But even worse if the tanker comes by a classical kite fighting event where goal is for opponents to cut the other guy’s sail loose with a rope lacquered with broken glass. However long new group of fast ferries are in local waters- and I think it’ll be longer than last- which was awhile and a lot of development ago. Most pressing reason, though. Try to get from Highway 3 to the Bainbridge Island Ferry. It’s full of cars mostly stuck.Which ending the boats won’t make go away. Bet the “Mosquito Fleet” had some insects there before that mode went away. “Brand” it as a return, and could get enough passengers to buy the jet fuel extracted from donuts. While Kitsap is growing, Kingston is in an inconvenient location for most of the peninsula and would involve a bit of backtracking on congested roads. The existing residents will not allow growth, because that would destroy the semi-rural lifestyle that was the reason they moved there in the first place. They’ll put all the GMA-required growth in Silverdale and Bremerton, and otherwise keep minimum lot sizes high, so that a one-acre lot can have only one house and open space. There will always be some people who prefer a 100% exurban or rural lifestyle including their livelihood, and work in agriculture or at home as artists or remote tech workers or in the mediocre jobs available in those areas or live “off the grid” raising chickens and such, and come to the city only occasionally for ballgames or shopping trips or legal issues. But most people on the penninsula still commute to Seattle or Tacoma because that’s where the jobs are, especially the higher-paying jobs. They work not just in downtown Seattle but all over Seattle, north Pierce County, and south King County, at Boeing and other places. But look at it the other way round: not where most West Sounders work, but where most people in those kinds of jobs want to live. Then you get a very different picture. Many people who want an exurban lifestyle but work in Seattle will consider living in Black Diamond, Marysville, or Monroe, but they won’t consider Vashon Island or Kitsap or Island Counties because they’re too inconvenient. Or look at Mt Vernon. If Kitsap County could add 100,000 people, then it would be even easier for Skagit County which is much more convenient to the jobs centers. But we don’t see a Lynnwood being built in Skagit County. As the reverse commute ferries should have plenty of space (and using them shouldn’t displace anyone who is actually paying the taxes to finance it), elected to only look at them. Looks like AM transfers from the passenger ferry to the WSF ferry at Kingston are really tight (maybe by design?) – about 6 minutes. If one could make it … fine … but won’t assume it. Transfers from ST/CT to the WSF ferry in Edmonds also aren’t stellar; generally better from the ferry to CT/ST. Doing any of the ferry stretches in the dark sort-of defeats any purpose the trip might have, so that limits the possibilities. The below uses the WSF assumption that Edmonds/Kingston takes 30 minutes – in my limited experience that’s a bit much, but may give more slack for late ferries. That last option looks like a great one to try on my next visit to Seattle. Seems like a great excursion to see the sound from rail, and again from the water. Thanks for the research! What would the total cost be for a visitor? It’s slightly cheaper to go eastbound on the state ferries as they don’t charge walk on passengers going east. You make up for it by getting charged more westbound on the Kitsap Transit ferry. but this could be increased by that time. For the Kitsap Ferries it is $10 westbound and $2 eastbound. Skip a WSF boat in Kingston and get crepes at J’aime Les Crepes across the street from the sidewalk out of yhe terminal. There’s also a lovely 20ish mile bike ride possibility now. Interestingly, I’m looking at Google Maps and I see state route numbers on the ferry routes! Should these services be numbered? If so, how would that work when there are different types of ferries? I can’t tell you how many times I hear casual or tourist ferry riders getting confused as so many small towns are not well-known. Having auto and non-auto ferries is also confusing (although by calling the West Seattle ferry a “taxi” does help make that clear). Some consistent enumeration and naming scheme would probably be greatly appreciated! Since 1994, the state ferries have been part of the legal definitions of the state highway system. SR 339 was created to cover the Vashon-Seattle passenger ferry route, which is now under county jurisdiction, so it technically doesn’t exist. There’s not much of a need to give the ferries their own number…just saying that Highway 104 continues onto the ferry is fine enough. Though the San Juan route (currently Highway 20 Spur) should be given its own number to prevent confusion. Does anyone know if it’s possible to bring bikes on to this new ferry? Yes, there’s a bike rack at the front of the lower deck that can hold four normal-sized bicycles. What’s everybody’s guess about compared capacity and operations between hydrofoils and Sounder Commuter Trains? One thing: traffic jams will swiftly become a thing of the past. No “biggie”. In crowded channels, either control system to handle hundreds of boats, from wide flat floating parking garages, to airborne-boat traffic control. However, something all today’s comments have to keep in mind. These links clearly show that our grand-kids’ commute won’t be their great-grandfathers’ Kitsap anymore. This is awesome for foot passengers. But I and others should be interested in an analysis of GHG effects vs. foot passengers on the car ferry. Boats are very energy-inefficient means of transportation, which gets double inefficient when you separate boats running back and forth carrying passengers and cars, rather than the same boat carrying both. In the case of the Seattle->Kingston route, this is compounded by the fact that faster speeds make a boat even more inefficient, and also that Seattle->Kingston is much more boat miles than Edmonds->Kingston. Of course, the be fair, the car ferry option, passengers have to get from Edmonds to DT Seattle somehow, but trains are much more fuel efficient than boats, and north Sounder has plenty of idle capacity, so the marginal cost of accommodating the ferry transfers is effectively zero. Running these diesel boats at high speeds, which are always empty in the reverse direction, is a really wasteful operation from an emissions standpoint. It will be an even worse option once WSDOT moves their big boats to electric hybrid in the next couple of years. Will the number of walk-ons on the auto ferries actually go down? Will it go down to almost zero? That will be interesting to see. You still see hundreds of people walking off the car ferries on routes where there’s a parallel car ferry, Part of it is probably capacity limitations on the passenger ferries, or people forgetting they exist or not knowing their schedule, and the passenger ferries don’t run all the time. I wonder how these boats will affect the orcas. In all the focus on wake reduction, have they even considered this? They’re nothing compared to even a slow moving cargo ship. The point isn’t to reduce the “wake” but the latent noise of the engine. The easiest/cheapest way to do that is by slowing the boat down. Please be aware that “wake” reduction is what wealthy beachfront property owners used to kill the previous version of the Bremerton to Seattle foot ferry. They complained that the wake increased beach erronsion rate and sued to have the ferrys stopped. i’m waiting for an underwater hyperloop. Minor point about the coming Southworth ferry – currently a southworthian could take the triangle car boat to Vashon and then the Vashon Water Taxi to downtown, which is generally going to be much faster than taking the car boat to Fauntleroy and then the C.